Brewery Ommegang of Cooperstown, New York has long been one of my favorite breweries. Over the past two decades – the brewery celebrated its twentieth anniversary just last year – Ommegang has established and upheld a reputation for its exceptional interpretation of the venerable institutions of Belgian brewing – while throwing enough curveballs in the brewhouse (this is a baseball town, after all) to avoid being taken for granted as mere traditionalists. That the brewery is somewhat local – just a little drive through the farm country (and productive grassland habitat) west of my home in Albany – is more than enough reason for me to drink Ommegang beers and pay the occasional visit. Tucked away in the bucolic countryside of the Leatherstocking Region, just south of the historic home of James Fenimore Cooper, Ommegang sits on the former grounds of a pre-Prohibition hops farmstead (central New York was the hops capital of the nation in the nineteenth century; following its demise at the hands of the Volstead Act, large-scale cultivation shifted – after repeal – to the Pacific Northwest). The brewery was founded by Vanburg & Dewulf, the largest importer of Belgian beer to the United States, back when classic ales like Duvel and Chimay were still sought-after rarities and American craft brewers were mostly producing British-style ales – only with tons of Cascade hops. Ommegang wasn’t quite the first Belgian-style brewery in the United States – it was predated by Colorado’s New Belgium Brewing and Allagash in Maine by a few years – but it reinforced this Old-World cachet with its distinctive packaging from the outset: in those early days, Ommegang’s range of saisons, wits, dubbels, tripels, and other lovingly reproduced Belgian styles were all put into handsome, three-liter amber glass bottles and capped by hand with a handsome cork-and-cage, giving their beers a prestigious presentation befitting the finest sparkling wines. While bottle-fermented beers, barrel-aging, spices, and other formerly well-kept secrets of Flemish and Wallonian brewers have since become commonplace techniques in stateside craft brewing, this stuff was real exotica in the late 1990s. Better yet, Ommegang’s domestic production allowed drinkers a taste of Belgium at a lower cost than the imports – and without the risk of stale, corked, or skunked beer posed by dusty old bottles after their rough transatlantic passage. As other American brewers gradually caught on to the charms of Belgian beer, Ommegang has quietly reached beyond its original traditionalist ambitions, all the while remaining true to its roots with always approachable and – to borrow a useful phrase popular among Belgian brewers – digestible beers. It’s supplemented its full-time, six-beer lineup with a succession of seasonal, limited, and collaborative releases over the years, including many spirited riffs outside the established bounds of Belgian brewing conventions. And in an unforgiving industry, Ommegang has avoided ruinous overexpansion, declining sales, and other common pitfalls of aging craft breweries without resorting to gimmicky attempts at relevance, remaining a steadfast but quietly inventive brewery in this sleepy corner of New York. If great beer wasn’t reason enough, Brewery Ommegang makes a wonderfully picturesque place to visit, too. Breweries are often unsightly, industrial places of corrugated aluminum and concrete floors, but Ommegang has taken great pains to unite form and function in its brewhouse architecture. The centerpiece of its operation is a handsome, custom-built brewery modeled after traditional Belgian farmhouse models, with bright white walls, patterned shingles, and a broad, welcoming archway. Over the years, this site has hosted many popular festivals, concerts, and tours, as well as an on-site café serving traditional Belgian fare like waffles and frites, and – of course – a bottle shop. All this has helped Ommegang become a tourist attraction in its own right. With the brewery expecting about 80,000 visitors this year, it recently completed an ambitious expansion of its facilities – today, in fact! It’s also not a bad place for some incidental birding while sampling a flight of beers after touring the brewery, as evidenced by my checklist from a visit last summer. Speaking of birds – I was getting to that. Since I started this gig, I’ve been taking a second look at Ommegang’s familiar labels, hoping to come across a bird in there somewhere I may have missed over the years, without much luck. True, there is what looks like a dove sitting with a fox in silhouette on the Rare Vos label, and in 2015, Ommegang released a dark saison called Three-Eyed Raven as part of its licensing partnership with the hugely popular HBO series Game of Thrones. (Obviously, this would have marked the first instance of an avian parietal eye at Booze and Birds, but my beat was two years too late for this limited-edition beer – I’ll of course continue to keep an eye out for other three-eyed birds). 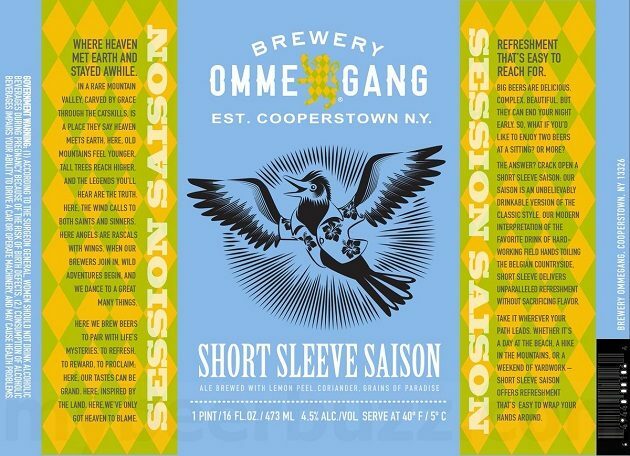 But for all its other virtues, Ommegang has largely overlooked birds in its marketing – until this year, when the brewery released a new spring seasonal called Short Sleeve Saison. I can’t claim that the playful bird image that accompanies this release is an obvious likeness of any particular species – it’s more of a generic songbird that most people (i.e., non-birders) envision when they hear the word “bird” – but it bears a passing resemblance to the American Robin. And considering that species’ role as an augur of spring to non-birders, I’m going with that tentative identification (ignoring the fact that I always add American Robin to my year list in the first week of January). Ommegang released Short Sleeve Saison way back in March, but I didn’t notice it on the shelves until this month (I blame the dizzying frenzy of spring migration) but there’s still plenty of time left to enjoy this warm-weather delight. While saisons were traditionally brewed in Belgium in the winter as a light, refreshing ale of modest strength suitable for serving to summer field workers (known as “saissoniers”), the potency of commercial versions over the years has crept to levels that would render most farm workers immobile after a glass or two. Ommegang’s own excellent Hennepin is in the mold of these stronger, latter-day saisons, so it isn’t entirely inappropriate to view the lighter Short Sleeve Saison – weighing in at a manageable 4.5% alcohol by volume – as a welcome return to the style’s more temperate heritage. It’s also more modestly spiced than Hennepin, with lemon peel, coriander, and grains of paradise – a peppery seed in the ginger family often used in Belgian brewing. Still, there’s plenty of flavor to this “lawnmower” saison, which pours a perfectly summery, slightly hazy, chiffon yellow. The white, rocky head exudes a bready nose with a fruity swirl of bubblegum, melon, and apricot. Topaz and Motueka hops, two popular southern hemisphere varieties from Australia and New Zealand, provide a restrained dose of citrus and pine redolent of Meyer lemons, while Ommegang’s spicy yeast strain delivers hints of earthy white pepper and warming clove. Short Sleeve greets the palate with an assertive and effervescent nip of citrus and ginger, with soft hints of floral honey, a wash of green pear and cantaloupe, and a trace of wheat malt. The finish is pithy, refreshingly bitter and peppery, with a clean, crisp mineral finish. 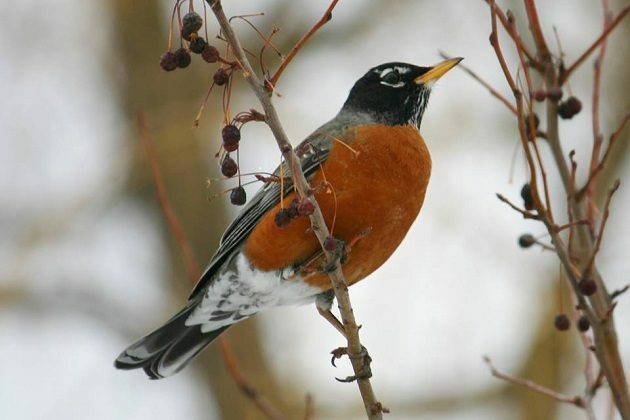 An American Robin in winter – possibly inebriated on fermented berries – waiting for the return of short-sleeve weather. 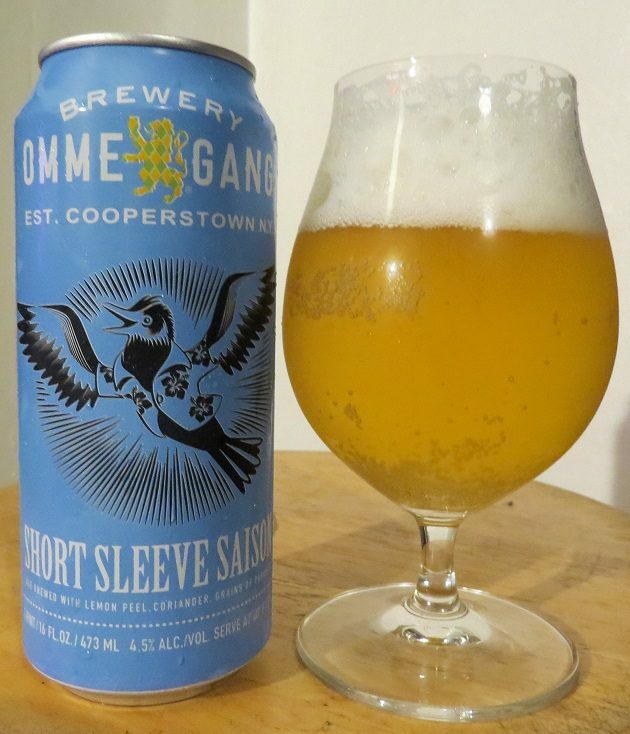 Thanks to newly-installed canning facilities at Ommegang, Short Sleeve Saison is available both in standard 12-ounce bottles and 16-ounce cans that are perfect for stowing in the cooler. As much as I enjoy the traditional Belgian bottles with their brass wire hoods, taking a corked bottle to the beach isn’t always practical and can come across as a bit fussy. It’s nice to see Ommegang chilling out a bit after so many years.